1753-1813. He was born on 27 March 1753 at Great Yarmouth, the eldest surviving son of ten children of the German-born physician and writer Raphael Schomberg, and of his wife, Elizabeth Crowcher. He was the nephew of Captain Sir Alexander Schomberg, his cousins were Admiral Alexander Wilmot Schomberg and Commodore Sir Charles Marsh Schomberg, and he was a descendant of a European mercenary soldier, the Duke of Schomberg. In October 1770 Schomberg entered aboard the yacht Royal Charlotte, commanded by Captain Sir Peter Denis. He removed shortly afterwards to the Spithead-based guardship Prudent 64, commanded by his uncle, Alexander Schomberg, and for three years from 1771 until she was paid off in September 1774 he served aboard the Trident 64, Captain Charles Ellys, the flagship of the promoted Rear-Admiral Denis in the Mediterranean. In 1776 Schomberg joined the Romney 50, Captain Elliott Salter, taking the flag of Rear-Admiral James Montagu out to the Newfoundland station. He was promoted to the rank of lieutenant by Montagu on 21 August 1777 and commanded the schooner Labrador and briefly the brig Hinchinbrook before returning to England aboard the Europe 64, Captain Richard King, in November 1778. In February 1779 he joined the Canada 74, commanded initially by Hugh Dalrymple, then, on his death by Sir George Collier from 1780. In this vessel he served at the relief of Gibraltar on 12 April 1781, and at the capture of the Spanish frigate Santa Leocadia 34 on 2 May. Later that summer Captain Hon. William Cornwallis took command of the Canada, and she went out to North America to join Rear-Admiral Sir Samuel Hood, sailing afterwards with the fleet to the Leeward Islands. Schomberg thereby participated in the Battles of St. Kitts on 25/26 January 1782 and the Saintes on 12 April. By the time the Canada set sail for England Schomberg had risen to become her first lieutenant, but remaining in the Leeward Islands he transferred to Hood’s flagship, the Barfleur 98, Captain John Knight, on which he served until the peace. On 10 April 1786, after several years’ unemployment, he was appointed first lieutenant to the young and inexperienced Prince William, with whom he had served on the Barfleur, and who had been given the command of the frigate Pegasus 28. Schomberg regarded his role as little more than that of a guardian to the prince, but after going out to Newfoundland, and thereafter in the autumn to the Leeward Islands, a prevailing discord between them erupted once William attempted to assert his authority. At Antigua Schomberg disobeyed a certain order relating to the granting of leave ashore for the men, and after being castigated by the prince he demanded a court martial. The matter was referred to the senior officer on the station, Captain Horatio Nelson, who immediately put Schomberg under arrest. As there was an insufficient number of captains present on the station to convene a court martial the Pegasus was despatched to Jamaica where Commodore Alan Gardner wisely resolved the matter by superseding Schomberg and sending him back to England. Arriving home in July 1787, Schomberg was initially placed on half-pay, before on 1 October he was appointed a lieutenant of the Barfleur 98, Captain John Knight, flying the flag of Vice-Admiral Lord Hood at Portsmouth. This was clearly a mark of faith from Hood, but although it was reported in the newspapers that the dispute between Schomberg and William had been a ‘misunderstanding’, the prince wasted little time in firing off a vitriolic letter of complaint to the admiral for his employment of Schomberg. 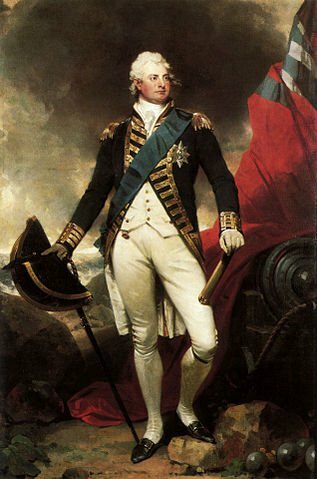 In October 1788 Schomberg was appointed the senior lieutenant of the Crown 64, Captain James Cornwallis, which in February 1789 took Commodore Hon. William Cornwallis’ broad pennant out to India. On 3 March 1790 he was promoted commander, and for a short while he commanded the Crown whilst waiting to exchange with Captain Maurice Delgarno of the sloop Atalanta 14, eventually doing so on 10 July in the Andaman Isles. It was not long before Schomberg courted further controversy, for when the fort at Madras failed to provide the customary salute upon his sailing into the harbour on 13 September 1790 he indignantly referred the matter to the senior officer present, Captain Sir Richard Strachan. Advised to ‘act as he saw fit’, Schomberg unfortunately saw fit to despatch a damning letter to the governor who then responded in kind to Strachan by questioning the right of a junior officer to make such inflammatory comments. Once Commodore Cornwallis arrived at Madras he immediately agreed with the governor’s position, and so Schomberg found himself superseded once more and sent home on the premise of ill health. Upon arriving in England in the summer of 1791 he found that he had been one of many officers posted captain on 22 November 1790, so no doubt the resultant beaching on half-pay was less un-palatable. In December 1793 Schomberg was appointed to the Vanguard 74, on which he remained for but a few weeks until she was ordered out to the Leeward Islands, whereupon he relinquished the command to Captain Charles Sawyer. Joining the Culloden 74 in April 1794 in place of Captain Sir Thomas Rich who had been elevated to flag rank, he fought at the Battle of the Glorious First of June when his ship was one of a handful that were ordered by the commander-in-chief, Admiral Lord Howe, to make more sail before the action. During the battle his vessel did little to distinguish herself from a position that was deemed as too far to windward, and although the Vengeur 74 struck to Schomberg it was only after her long and bloody engagement with the Brunswick 74. The Culloden suffered casualties of two men killed and five wounded in the battle and Schomberg was one of a number of captains who did not receive a gold medal. He left the Culloden in the late summer after flying the flag of Rear-Admiral Rich in the Channel, but whilst he was recommissioning the cut-down Magnanime 44 at Plymouth the very unhappy crew of the Culloden mutinied at Spithead against their new captain, Thomas Troubridge, on 3 December. In April 1795 Schomberg took the Magnanime out on a cruise, and she was otherwise employed in convoy duty in home waters until he was succeeded by Captain Hon. Michael de Courcy in the early autumn. Retiring ashore to Seend in Wiltshire on account of a long-standing liver complaint, he authored a most useful reference work ‘Naval Chronology, Or an Historical Summary of Naval and Maritime Events… from the Time of the Romans, to the Treaty of Peace of Amiens ’ which was published in 1802. From 1801-2 Schomberg commanded the Sea Fencibles from Harwich to Southend, and from 1803 until September 1808 commanded the Sea Fencibles from Beachy Head to Dungeness, being based at Hastings. At the end of this period he was largely responsible for advocating the disbandment of the Sea Fencibles, as the threat of invasion from France had passed. In September 1808 it was announced that he had been appointed deputy-comptroller in the room of Captain Sir Robert Barlow, but it appears that he had some qualms about superseding his brother officer and so instead he was appointed a naval commissioner without special functions on 22 September. Captain Schomberg died at 22 Cadogan Place, Sloan Street, Chelsea on 21 January 1813. He was buried in the family vault at St. George-in-the-East, Stepney. He married Amelia Brodrick, daughter of the Reverend Laurence Brodrick of Stradbally, Ireland at Pangbourne, Berkshire on 13 August 1793 and had issue four sons, the third of whom, Henry Charles Schomberg, born on 1 August 1804, entered the service in 1818, and was promoted lieutenant in 1827. Schomberg was viewed as a good seaman, being efficient, brave and sensible, ‘scholarly and exact’, but in so doing he appeared rude and abrasive to his seniors, and somewhat self-important, these being traits similar to those of his patron, Lord Hood. His apparent abrasiveness was almost certainly not helped by his late promotion to the rank of post-captain.